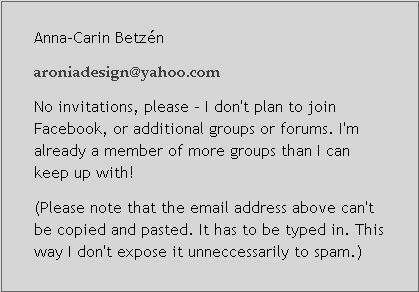 My name is Anna-Carin Betzén, and I live in Sweden (or, more precisely: in Jakobsberg, a suburb of Stockholm). I have a M.Sc. degree in Computer Science and have worked in related areas for several years now. In my spare time I enjoy building miniatures, as you can see on this site. All items are in 1:48 (also known as 1/4") scale unless otherwise stated. Like many other Swedish girls, I got a Lundby dollhouse and lots of furniture for it. I didn't make any things for my dollhouse, except for trying to embroider a doily. 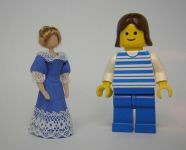 As the Lundby furniture was very detailed and well made, my attempts looked clumsy and I was discouraged. Still, I had lots of fun arranging the furniture. Also, I spent lots of time setting the dining table over and over again, only because cups and glasses wouldn't stay put. I wish I had known about holding wax then! This dollhouse and all the furnishings were stowed away when I grew to old to play with it, and I hope to unpack it eventually. Sometimes when I visited my grandparents, grandpa took out some little model houses for me to look at. The scale was 1:70, or about 1/6" scale, to match some toy cars he'd bought. He'd built the houses from scratch in the late 1950s, to help him and grandma decide which catalog house they would build IRL. In his line of work he used a pantographic engraving machine, which basically enabled him to cut and engrave parts for the houses with a quality similar to that of today's laser cut kits - though it took a lot more work! I was always intrigued by how small and neat they were. Today I own three of the houses. I had a lot of Lego and loved building houses and towns with it, furnishing the houses with Lego as best I could. 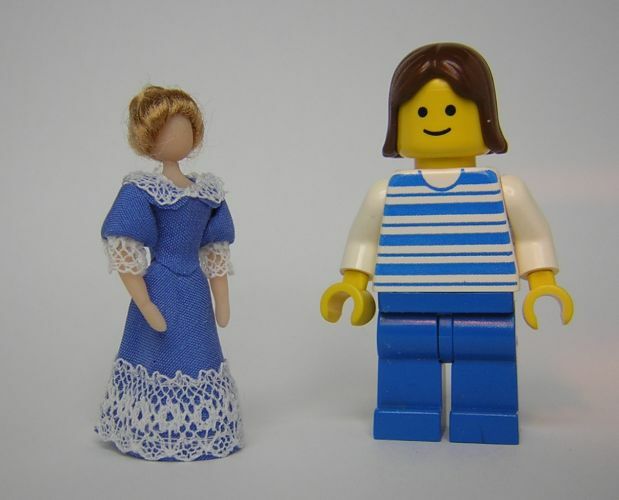 Later, I've realized that Lego people are about the same height as 1:48 scale people, only differently proportioned, like this photo shows. In 1994, I got an issue of the American magazine Miniature Collector for Christmas. I was completely fascinated by it, read it over and over again, and got a subscription. But I was studying and lived with my parents, and didn't have the space, money, nor time needed for making miniatures. In 1996 I joined the online group Tiny Talk (which no longer exists), and met a local mini friend through it. I made a few attempts at 1:12 scale food from polymer clay, but finishing my degree was of course my top priority at that time. I married, got my degree, and got a job. Now I finally had the chance to make minis! 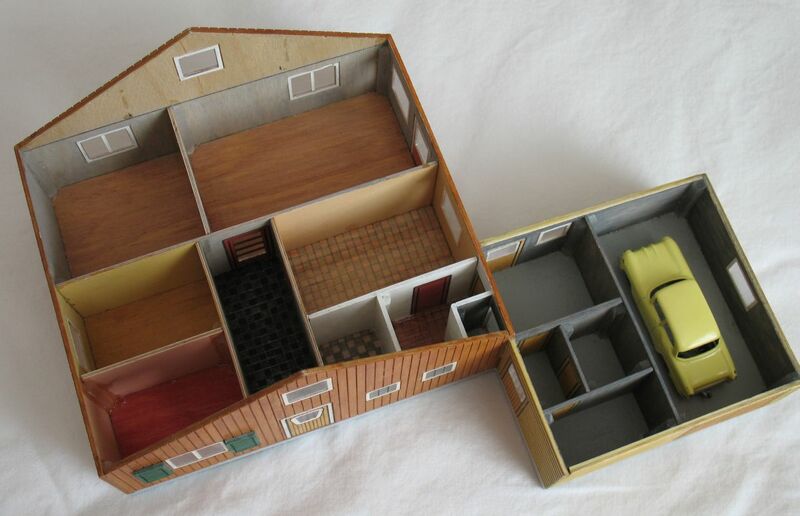 At Tiny Talk I heard of the Nutshell News magazine (now Dollhouse Miniatures), and when I got hold of a recent issue, it had building instructions for the cutest little furniture I'd ever seen - Arts and Crafts furniture in 1:48 scale! It was designed by Madelyn Cook. I had no idea that it was possible to make such tiny little furniture and still get that level of realism, but I knew at once that this was something I wanted to do! I especially liked the fact that this furniture barely required any tools beyond a hobby knife. Of course I got a subscription for Nutshell News straight away. The first issue of my Nutshell News subscription held instructions for a 1:48 scale Arts and Crafts sideboard. I built one using balsa from a local model building shop, but found it was too easily marred by finger nails and tools. Next I tried veneer, and scale lumber from the model railroad shop, which turned out much better. During this time (early 1997), I also reduced a couple of 1" scale designs, including the arbor shown on this site. My local mini friend had long been a subscriber of Nutshell News , and kindly lent me all her back issues. In order to build more of the Arts and Crafts furniture, I took the plunge and ordered plastic model parts and basswood strips from Grandt Line and Northeastern Scale Models in the USA, and eventually a chopper so cutting would be easier. Through Tiny Talk I also heard of a newsletter on 1:48 scale, Little Enough News, published since December 1996. I wanted to subscribe, and was surprised to get a personal reply from editor Pam Scott, saying how happy she was to get a Swedish subscriber, as she herself was of Swedish ancestry! We soon became close friends, and I've repeatedly contributed how-tos to "LEN" over the years, until she ceased to publish it in 2004. I've also done some genealogical research for her. My Little Enough News page shows many of my projects in LEN, as well as link and information for ordering back issues. No matter how fun it is to make things from scratch, or order from abroad, nothing is like shopping on a show and meeting other miniaturists! 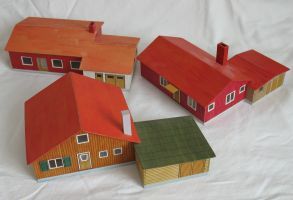 The dollhouse hobby is catching on in Sweden and there have been mini shows in Stockholm every Spring and Fall since the mid-1990s. I've always kept an eye open for 1:12 scale mini items that can be used in 1:48 scale, and made my antiques shop to show off some of my finds. I got the opportunity of exhibiting my English Cottage on a Swedish mini show, and as some people showed great interest I decided to have a table at the next show. Unfortunately, though many had been intrigued by the displayed house, very few were interested in actually buying 1:48 minis, kits, or building instructions. I decided to save my money and instead use the internet to show off my minis "internationally", launching my first website in October 2001. In 2000, my minis were featured in a couple of articles in the Swedish miniatures magazine "Miniatyrvärlden" (The Miniature World). Since then, single photos of my minis have been included in the magazine on a few occasions. My Miniatyrvärlden page lists my DIY projects that have been printed in the magazine. I've focused on fairly easy 1:48 scale projects, preferably ones that can be used in 1:12 scale as well. In 2004 I gave a talk on 1:48 scale at the annual meeting of the Swedish Miniaturists' Society (Miniatyrsällskapet). The listeners seemed very interested, especially in the minis I'd brought along. For the past few years I've been going to a mini group that meets once a month. We each working on our minis and show off our recent creations and purchases. One of the other members has been inspired to do some 1:48 minis on and off, and I love to see her latest creations. After LEN stopped being published in 2004, I've kept creating a few how-to projects each year, putting some of them on my website and submitting the rest to the Swedish mini magazine. 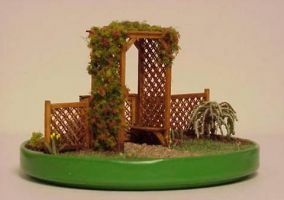 In 2005 I put 1:144 scale how-tos on my website for the first time, and since then I've often had some new 1:144 scale projects on my site in time for the the yearly convention of the Microminis Yahoo group. In 2009 my first website reached its space limit, so I could no longer add to it. I was redeveloping a company website at the time, and learning a lot of tricks that I wanted to use on my own site. I decided it was about time to reimplement my own site, giving it a new look and moving it to different provider which accommodated the technology I wanted to use. 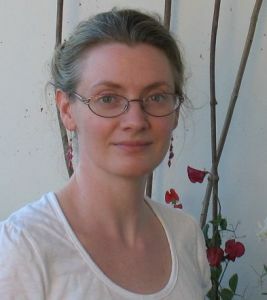 After working on my new site on and off for a few months, I launched it in August 2010 and closed down my old site.